Looking for the perfect gift or gifts for someone who loves to travel? 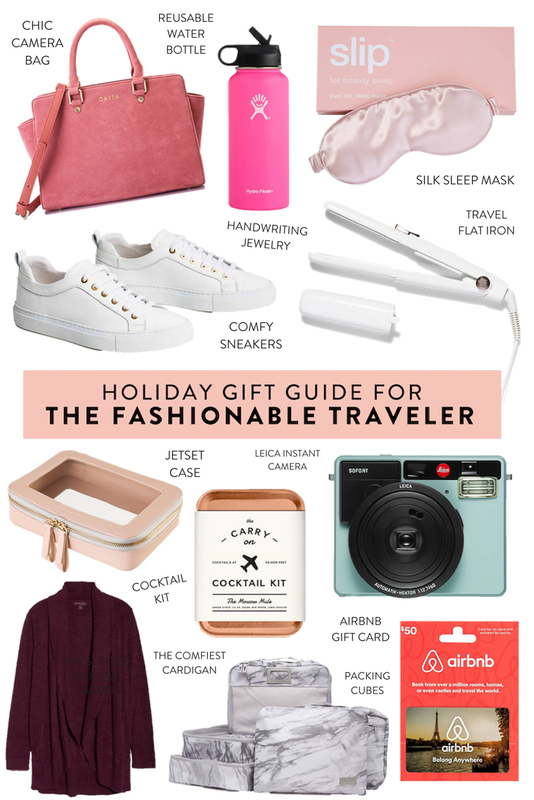 Here are the best gifts for travelers, at all price points! Handmade Italian Leather Sneakers — THE Best Shoes For Travel! White leather sneakers from M. Gemi, handmade (yes, really) in Italy — the perfect shoes for literally anyone. Featuring soft gold eyelets and rich, artisan-treated leather, they go with all outfits and can be worn all day everyday (seriously). Since my mom bought me these for my birthday a few years ago I have never traveled anywhere without them and also wear them a few times per week every week while home in SF. If you want to treat someone to the most comfortable, long lasting, fabulous shoes I have ever found (and trust me, I have tried a lot), these are them! PS. Get $50 OFF your first M. Gemi purchase HERE! TRUFFLE clutches, cases, and pouches are not only beautiful but also incredible useful. My carry-on tote is full of these not only when I am traveling but also on a day-to-day basis when not on the road. They make a wonderful treat for anyone that loves to stay organized (or aims to, at least) in the most fashionable way possible. See the full details on how I use the TRUFFLE accessories HERE. Cameras are big these days. If you are shopping for someone that wants to upgrade from their phone camera, I would recommend the Sony Alpha a6500 mirrorless camera. Mirrorless cameras are cheaper than a dSLR, lighter, and more compact making it perfect for travelers wanting to capture great images without breaking the bank! And the Sony Alpha a6500 is a blogger/Instagrammer favorite and the perfect starting point. Note: for a bit cheaper you could get the Sony Alpha a6300 if needed. It’s an older version of the a6500 (a6500 is the latest and greatest). A great gift for the gal that loves jewelry and also traveling is a coordinate necklace or a state charm necklace. It allows them to carry a piece of home (or another special place) with them wherever they go! I especially love these ones from Made by Mary because all of their jewelry is great quality. Looking for something a little more sentimental? Handwriting jewelry is it. A few years ago for Christmas I had necklaces made for my mom, my sister, and I of the word “aloha” in my grandpa’s handwriting. To this day it’s the most special gift I’ve ever given them, one that they continue to wear everyday and never stop talking about. If you’re interested in a solid gold option that will last forever, this has been on my want list for a very long time. For something on the more affordable side, Mackenzie Treasury offers necklaces, rings, bracelets, and more in plated metals. Airbnb is a site that connects travelers with unique accommodations around the globe. What I love most about it is that you can find a place at any price range and generally with a lot more charm than that of a hotel - making an Airbnb gift card ($50 or $100) the perfect gift for any traveler! Other great gift card options for travelers: Hotel.com, Uber, Starbucks, Southwest Airlines, Sephora, Amazon, or VISA. An easy and inexpensive gift for the traveler that appreciates a good cocktail! Sleep masks are very important for travelers, so why not treat them to a nice silk one? I love Slip and especially love that it comes with a silk pillowcase which is great for anti-aging and for keeping your hair style in tact overnight! If you prefer just the sleep mask, that’s an option too. Another item that literally anyone would LOVE, this Barefoot Dreams cardigan is the softest, warmest, most wonderful thing I’ve found all year! It’s the best for wearing on the plane or train, while out and about, AND while lounging around the hotel. The only problem is that once you buy them one, they’re going to want ten more! Their blankets are also to die for if you want to get them something to enjoy between trips! If you somehow know a traveler that does not yet use packing cubes, this will change their life! I resisted these for awhile myself but after eventually giving in I have never looked back. These Calpak cubes are by far the most glamorous ones I have found. I especially love the gold marble, milk marble, leopard, and rose gold. Adobe Lightroom is the one program that all travelers and photogs or aspiring photogs should own. I use it religiously and when comparing price, ease of use, and quality there is nothing I recommend more! If you're shopping for a traveler that is trying to improve their photography, this one year Adobe Lightroom subscription is the perfect gift. For anyone that appreciates photos or recording moments, this Leica instant camera is THE coolest. It’s small but incredibly powerful, with a built-in flash, self-timer, retractable zoom, and even adjustable aperture (what?!). Yet another thing that literally anyone that travels will appreciate, a reusable water bottle! And not just any reusable water bottle, but the best one out there. This Hydro Flask bottle keeps hot drinks hot, cold drinks cold, and is perfect for bringing anywhere. The perfect gift for any frequent traveler that straightens their hair! It is compact, has auto world voltage (whoa! ), and is perfect for straightening, curling, shaping, and more. Available in white and also pink.